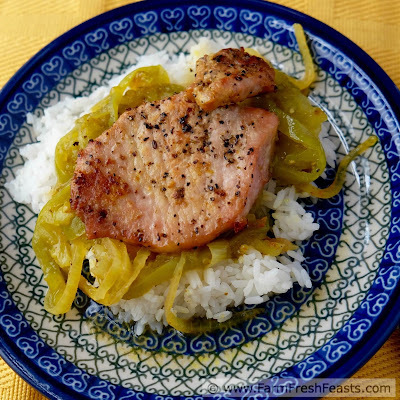 Pork chops baked with curry-seasoned green tomatoes and onions in this homey casserole from a vintage cookbook. 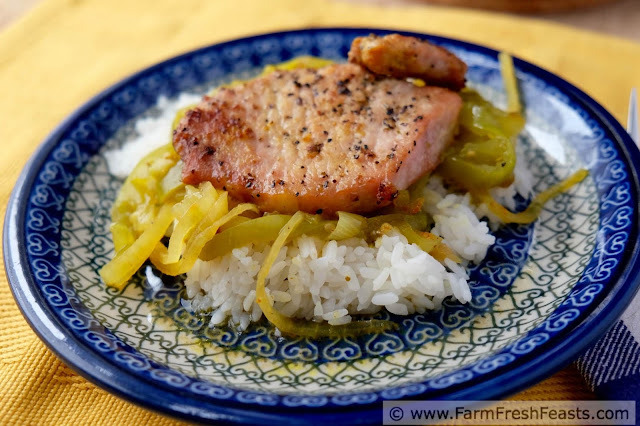 Each time I make this dish, I add a few tweaks on the seasonings but keep the main elements of pork chops, green tomatoes, and onions. I'm happy to report that this casserole is delicious over rice and my family still ate it all up! I used lemon pepper seasoning with the pork chops and hot curry instead of sweet curry on the vegetables--and they were very flavorful. Right now the seasons are a bit topsy turvy. The temperature swings from shorts to sweater weather. I'm excited to turn on the oven but still using the grill. The trees have started to change colors and I foresee leaf raking in the not to distant future. Yet the tomato plants are still plugging away, producing plenty of tomatoes. Once the night temperature dips far enough, there's no amount of sunny days that will bring me red tomatoes. I need to bring them in to ripen--or learn to love green tomatoes. This recipe is one of the ways I've embraced green tomatoes, and I'm glad to re-share it with you. A heart-warming dish for a cold day. chops. Bake uncovered at 350 degrees (mod. oven) 45 min. (30-45 min more). Serve hot. A dish that prefers green tomatoes? A recipe with curry powder? I have to try this. 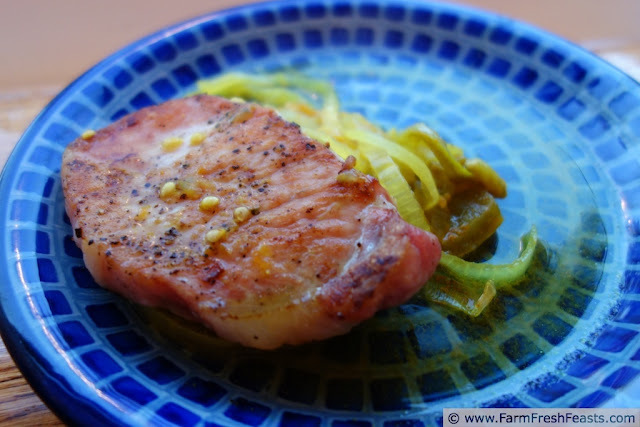 Lucky for me I found pork chops marked down for quick sale a few days later so I was able to add this to the dinner lineup without any additional grocery store/farmer's market trips. I've usually got onions & curry powder on hand since we also like Jen's Divine Turkey Divan! Why yes, my kid did make my lidded salt dish. Thanks for noticing! NOTE: The first time I made this, I didn't do the 'nestle the chop' bit-I put the casserole in the oven and took off to pick up one child, and had my minion other child cover the casserole at the midpoint. The chops were good and moist, but they would have been moister (?) had they been flipped and nestled. We thought this tasted pretty good, and was an interesting way to use green tomatoes. 2015 Update: I used hot curry powder on the tomatoes/onions and lemon pepper seasoning on the pork. I followed the instructions to 'flip and nestle' the pork chops at the midpoint of the baking time and that worked great. It's definitely a keeper. I created this recipe to be gluten free through my choice of ingredients. Check labels to confirm that your products are also gluten free. Preheat the oven to 350 degrees Fahrenheit and preheat a medium skillet to medium-high heat (add a turn of oil around the skillet too). Season one side of the pork chops with the lemon pepper seasoning OR about ½ teaspoon salt and a couple grinds of pepper. Place the chops seasoned side down in the preheated skillet. Repeat the seasonings on the unseasoned side, and brown the chops 3-4 minutes per side. They won't be cooked through, and that's OK. You're going to pop them in the oven to finish. Lightly oil a casserole dish (I used an oval 2.8L dish and it was plenty roomy). Place half of the onions in a layer across the bottom. Sprinkle the entire layer with a pinch of salt and a pinch of curry powder. Top with a layer of half of the tomatoes. Repeat salt and curry seasoning like on the onions. Repeat with the rest of the onions, more salt & curry powder, then the rest of the tomatoes and salt and curry powder. My best guess is that my pinches were around 1/4 teaspoon so I used a total of 1 teaspoon each Kosher salt and curry powder. But sprinkle by pinch when you do it and feel very vintage cookbook Cabin-Casserole-ish. 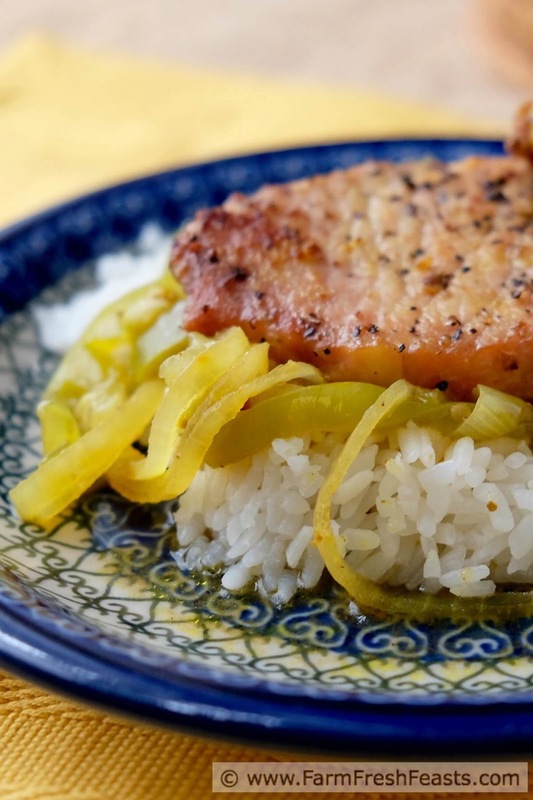 Top the vegetables with the browned pork chops. Bake at 350 degrees for 30 minutes, uncovered. Flip over the chops and nestle them down into the veggies at this point. Cover the casserole and continue baking until tender (for me, another 15 min). Very good served with rice. I'm leaving this up to show how my photography has changed over the past 3 years. For more recipes using green tomatoes (none of them fried) please see my Green Tomato Recipes Collection, part of the Visual Recipe Index by Ingredient, a resource for folks like me eating from the farm share, the farmer's market, the garden, the neighbor's garden, and great deals on ugly produce at the grocery store. This post was originally published in 2012 and the photos updated in 2015. Yum. I love green tomatoes. Now I do, too! Before I used to just wait for them to ripen. Silly me! Thanks for stopping by. I hope you do! Thanks for stopping by. Heck you can skip any steps you want! I so enjoy reading old cookbooks, the writing style is just delightful. I can't thank you enough for starting such a fantastic garden for us. We have enjoyed fresh tomatoes all Summer. 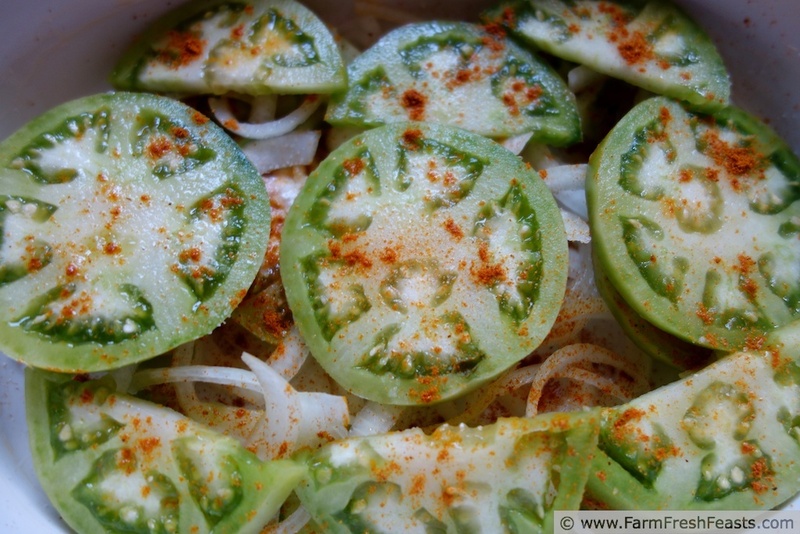 I will definitely try this recipe with some of our green tomatoes. I'm so glad your garden is producing prodigiously! We had such fun building it and many happy harvests--so I wish you much more of the same. 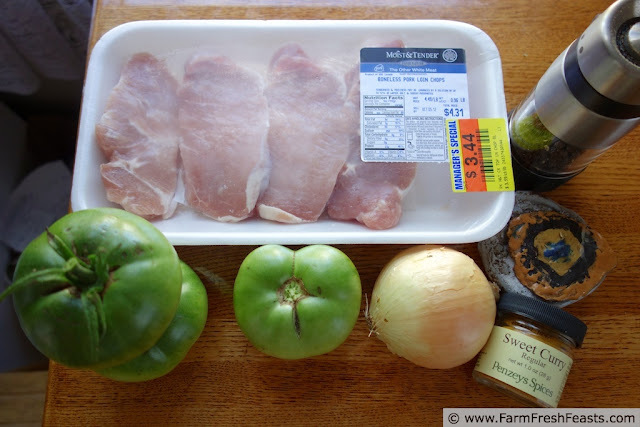 And if you like bacon--check out my Green Tomato Bacon Jam recipe. It's a freezer jam, no canning required, and a few spoonfuls added to burger meat really makes a burger taste better. Thank you so much for your comment--you've really made my day!